From passenger aircraft to military tanker plane. In Spain’s Getafe, the first two of a total of 8 A330 aircraft are currently being converted. The Netherlands has purchased them together with four NATO partners: Norway, Germany, Luxembourg and Belgium. This means that the KDC-10s, the current tankers of the air force, will be able to retire. The Airbus A330-MRTT is intended as a Multi Role Tanker Transport. To refuel aircraft in the air, it can carry up to 111,000 liters of kerosene. But carrying, in addition, 267 people or up to 45,000 kilos of goods is no problem for this aircraft. The Royal Netherlands Air Force now has two tankers, which were purchased in 1994: two KDC-10s. They have had their best years, and are in need of replacement. But that is not the only reason that the A330 MRTTs have been purchased. "We have a huge shortage in tanker capacity in Europe. We noticed this, for example, during the deployment in Libya*,", says Colonel Jurgen van der Biezen. He has become the new commander of the unit for the A330-MRTT. *: Between 1969 and 2011, Moammar Al-Kaddafi was leader of Libya. A dictator who ruled with a hard hand. The Libyans eventually went into protest in an attempt to knock the man off the throne. Gaddafi did not let that happen: he resisted and promised the rebels the death penalty. NATO intervened and countries worked together to protect the Libyan population from the air against attacks by creating a no-fly zone. The Netherlands supported the campaign with the KDC-10. Other European countries are also using tanker planes, but it soon appeared that the countries together have too few (effective) tankers to fully support the operation. This is changing with the A330-MRTT. The need was big, but ... new tankers are not cheap. "That's why we work together with other NATO partners," says Jan der Kinderen, who was there at the birth of the project. Since February, he is the NATO system manager of the Multi Role Tanker Transport Fleet (MMF). Before that, he worked for 34 years in the Royal Netherlands Air Force. "Cooperation has several advantages. The investment per country is proportional to the number of purchased flight hours. Some would never have been able to purchase their own device for that money. We also share, for example, the maintenance, the management layer of the unit and the personnel of the fly crews. " The A330 is being built in the French in Toulouse. From there they fly to the Airbus Defense and Space factory in the Getafe, Spain, where the brand-new aircraft are completely stripped. From insulation material to the cockpit: only a skeleton of the aircraft remains intact. That’s when conversion works begins. The boom is installed at the back. A rigid tank tube of 14 meters. With 360-degree cameras, which come under the plane, the Air Refueling Operator (ARO) sees how he connects the boom to the refueling aircraft. For example, F-16s, F-35s, C-17s and the AWACS are fueled high in the air. And that's going fast, too, and in a single second the boom pumps through 70 liters of kerosene. For other types of aircraft such as Eurofighters, Tornadoes and Mirage 2000s, the A330-MRTT is equipped with two Air-to-Air Refueling pods under the wings, which reel out flexible hoses for with a basket at the end which refueling aircraft hook in to. Protection has also been thought of. The aircraft gets an armored cockpit, while technicians also add a Directed Infrared Countermeasure (DIRCM) system. The laser of this typically advanced system dazzles the seeker head of incoming IR-guided missiles to disturb its trajectory. So, there is a lot of work on the aircraft, which explains why the entire transformation takes about a year. 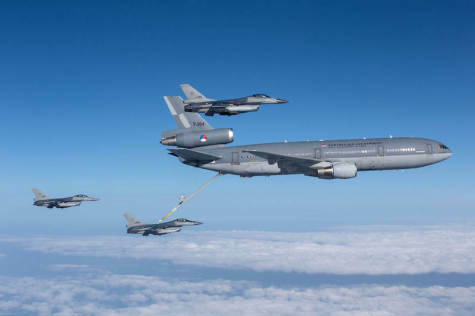 May 1, 2020 is the time when the first tanker will arrive at Eindhoven Air Base, the home base for five of these eight aircraft. The three other A330 MRTTs will go to the Forward Operating Base in the German city of Cologne. The eighth and final aircraft will be delivered in the summer of 2024. Norway wants to fly 100 hours per year with the tanker. Luxembourg wishes twice as many [even though it has no military aircraft—Ed.]. Belgium needs 1,000 flight hours with the MRTT. The Netherlands and Germany will have 2,000 and 5,500 hours, respectively. With eight aircraft (and 1,100 flight hours per aircraft per year) that works out exactly. "Pooling and sharing," summarizes Der Kinderen. "An alliance in which every country, regardless of the number of flying hours, is the same. That is why NATO is the owner of the aircraft. "